The TAG Heuer Aquaracer watches follow in the footsteps of the brand’s other collections as well as paving the way for future ones. Since their founding in 1860, TAG Heuer have been creating timepieces inspired by adrenaline filled-adventures, much like the TAG Heuer Carrera and TAG Heuer Formula 1 collections. Each timepiece is designed to push the boundaries and work with you in demanding situations with no risk of cracking under pressure. TAG Heuer Aquaracer watches have flourished and expanded with thanks to the unparalleled precision it can provide in the most volatile and anticipated of situations where accuracy is key. ‘Deep’ is in the DNA of TAG Heuer Aquaracer watches, equipped with an ability to comfortably explore depths of between 100m and 500m. Inspired by the aquatic world, many of the timepieces in the TAG Heuer Aquaracer collection feature a unidirectional bezel, used to measure limits or elapsing of time when diving. Should any accidental movement occur to the bezel, it can only reduce the remaining time indicated, crucial to a divers’ safety. Having patented the first water resistant case in 1895, TAG Heuer has poured their extensive expertise into the whole of the Aquaracer range, designing with diving in mind. Always pushing the boundaries, all TAG Heuer Aquaracer watches are subject to rigorous testing, perfecting its ability to not crack under pressure. These tests include exposure to salty fog, 93% humidity, pressure cookers with intense heat and a total of 160 water resistance tests. With a double security clasp and sapphire crystal glass covered dial which features luminescent markers, you can safely continue your journey with great visibility, into the night and into the dark depths of open water. The TAG Heuer Aquaracer is a perfect match for those wishing to own an iconic luxury timepiece without having to treat it delicately. You too can continue to swim, sail or surf: never stop exploring. 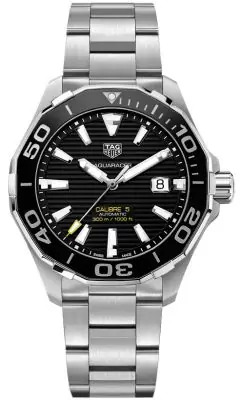 You can purchase your TAG Heuer Aquaracer watch on finance from 0% interest according to a flexible pay monthly plan that best suits you, if purchasing outright is not right for you. Buy today online or in one of our Lancaster or Kendal showrooms. As authorised TAG Heuer Aquaracer stockists, Banks Lyon Jewellers have a passionate and knowledgeable team and are more than happy to help with any further questions and assistance you may require. Simply call us on 01524 381 020, email personalshopper@bankslyon.co.uk or use our online chat. If you’d like you can also visit us instore in Lancaster or Kendal.